Can you just smell the browned butter in these breakfast muffins? Oh my! 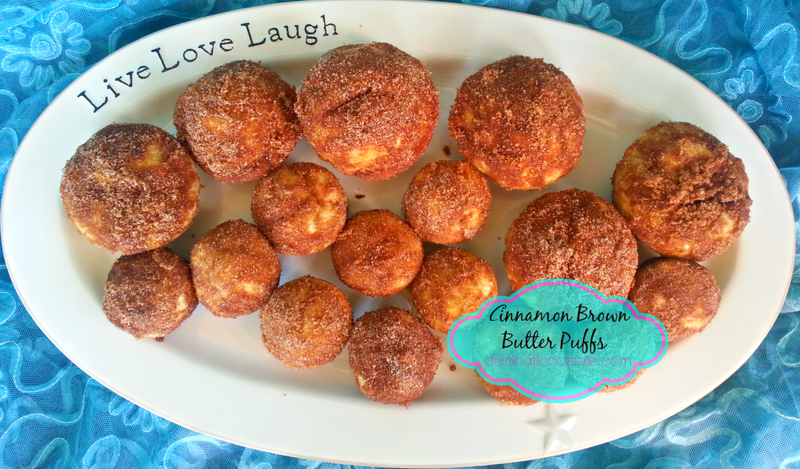 These cinnamon brown butter breakfast puffs will delight your taste buds! Yesterday was one of two Sundays each year when my family gets to watch church on TV in our jammies. It was the perfect morning to make some muffins so I decided to make these oh so delicious Cinnamon Brown Butter Breakfast Puffs- or as one of my sons-in law affectionately calls them, Love Muffins. I’ve enjoyed these muffins at my daughter Brook’s house but this was the first time I made them. Brook got the recipe from the Smitten Kitchen blog. If you truly need photos of each step you can find them there. It’s best to get the toppings ready first because they take so little time to bake, you don’t want to be scrambling to have something to dip them in. Yield: 9 to 12 standard muffin-size puffs or 30-ish miniature ones. Try not to overfill or you won’t get as great domes on them. I like to double the “goodness” in most recipes- that means, in this case, double the cinnamon sugar mix & the browned butter- yummm! The browning butter smells heavenly. Spoon into prepared muffin cups, filling only 3/4 of the way. (I filled mine higher and they ended up spilling over a bit and doming less than they are capable of.) Bake standard sized muffins for 20 to 25 minutes and miniature muffins for 12 to 14 minutes. When finished, muffins will feel springy to the touch and a toothpick inserted into the center will come out clean. Transfer the pan to a wire rack. As soon as you feel you’re able to pick one up, take your first puff and roll the top and upper edges in the browned butter. Don’t be afraid to pick up the browned butter solids at the bottom of the saucepan; Let any excess butter drip off for a second before gently rolling the butter-soaked cake top in cinnamon-sugar. If you roll too firmly, or have too much wet/not absorbed butter on top, the sugar can clump off, which is heartbreaking. Transfer puff to wire rack to set and repeat with remaining puffs. Eat warm or room temperature. They are wonderful either way. For an even more indulgent, doughnut-like puff: Make an extra two tablespoons of the browned butter and roll the whole puff in it and the cinnamon sugar. Do ahead: These breakfast muffins are best within hours after they are baked. They can be made it advance and stored in a freezer bag until needed, too. Simply spread them out on a baking tray and reheat them until warm in the oven. For added deliciousness you can add some cinnamon chips to the batter. We really liked the mini puffs best because I rolled them completely in the cinnamon sugar. I think I ate a dozen! Wow- are they ever delicious! They are so light, fluffy and moist. You are going to want to make these breakfast muffins all the time!